Wikimedia CommonsSmoke plumes from the Kuwaiti oil fires. After many years of dispute over Kuwait’s production of oil, at 2:00 AM on August 2, 1991, Iraqi forces led by Saddam Hussein invaded the neighbouring nation. Taken by surprise and instantly overwhelmed, Kuwaiti forces retreated to Saudi Arabia. In the coming months, the Iraqi Army developed a scorched-earth policy where they began systematically destroying the Kuwaiti oil fields. Although the exact reason for the destruction of the oil wells remain unclear, intelligence analysts have developed several plausible reasons. Theories range from the fact that if the oil wells were destroyed, smoke from the burning flames would obstruct the Coalition force’s vision and movement, and also render the valuable resources useless if the Coalition forces were in need of them. US NavyA US Navy Grumman F-14A Tomcat flies over an oil well set ablaze by Iraqi troops during the 1991 Gulf War. 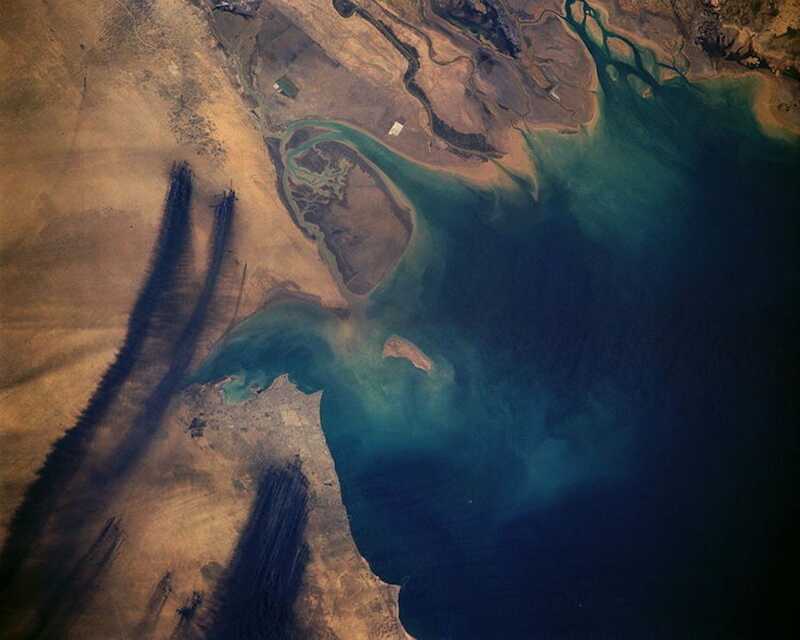 Whatever reasons were behind this decision, the environmental damage from the ignition of an estimated 700 oil wells was massive — smoke plumes carried dust and ashes about 1,600 kilometers, and nearly 1.5 billion barrels of oil to flowed into the Persian Gulf. 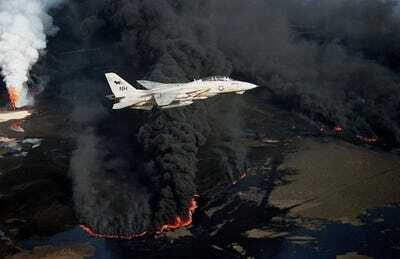 Baraka,’ show the haunting destruction of these oil wells.